Do you find that some of your students enjoy listening to music? Do they also have a good sense of rhythm and melody? If you have a student who likes to sing, hum, chant, rap, whistle and enjoys creating music, you may be witnessing a student who has a Musical Intelligence or Rhythmic Intelligence. In other words, these students may be Music Smart. 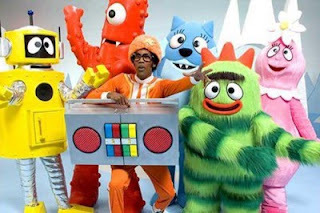 With music having a huge impact on today's children, it's no wonder why shows like Yo Gabba Gabba (pictured above) are an amazing success with kids. When your students use their musical rhythmic intelligence in the classroom, they may have a high ability level to communicate through music or understand the meaning of a piece of music. They may be able to play an instrument or sing and can also tell the difference between different pitches, timings, tones, and music notes. Here are some fun activities that you can use with your students who show a musical rhythmic intelligence, or a music smart.